The Tucson Gem & Mineral Society supports the promotion of mineral knowledge in our local Tucson community through interactive classroom learning experiences. Our team of knowledgable staff and volunteers create engaging learning opportunities for teachers and students alike. A cooperative effort between the Tucson Gem & Mineral Society and the Society of Earth Science Students from the University of Arizona provides a truly fun and educational experience for any child who loves the earth sciences. In the Junior Education area at our Show children go through a maze of educational experiments in an exciting interaction with the university students. They will go on a mineral “treasure hunt,” and bring home with them a variety of clearly identified specimens that will remind them for many years of this real and unique journey into the realm of science and education. 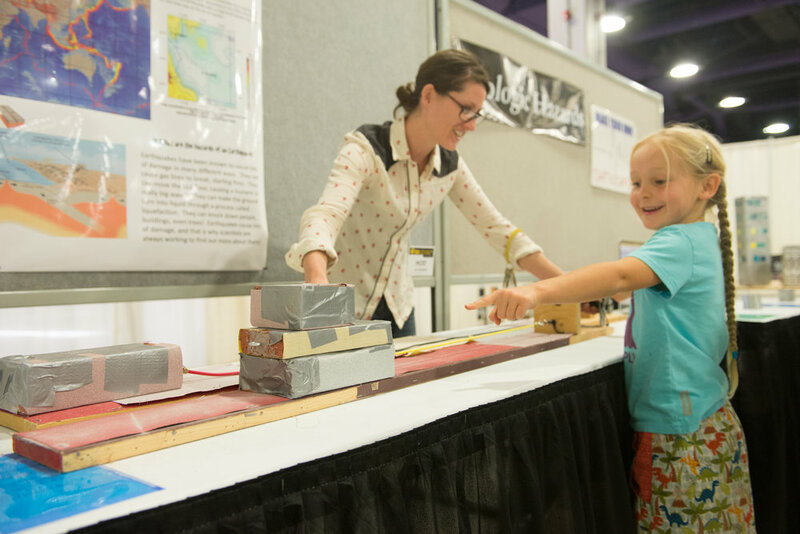 The Society and the Show Committee invite approximately 3,000 Arizona school students to attend free of charge, with their teachers and chaperones, to the Tucson Gem and Mineral Show®. This affords the children a special opportunity to view the exhibits and shop with the Dealers on Friday morning of Show week. To register for the "School Visits Program” is now closed, please join us next year! The Tucson Gem & Mineral Society supports the promotion of mineral knowledge in our local Tucson community through scholarships, grants, and awards. We reach out as well to the larger community of rock and gem lovers with support for publications such as Rock and Mineral Magazine, the Geoliterary Society, Mineralogy of Arizona, and the Mineralogical Record. The Society funds a graduate scholarship in the Geoscience's Department at the University of Arizona and provides a scholarship for the Boys and Girls Club of Tucson. Tucson Gem and Mineral Society grants have supported the mineral collections at the University of Arizona Mineral Museum, and the Arizona-Sonora Desert Museum on an annual basis for over 40 years. The Tucson Gem & Mineral Society is one of the "Rachel Carson" level sponsors of the Southern Arizona Research, Science and Engineering Foundation's "Fair" held each March (or April) in Tucson. In addition to that sponsorship, members from the Tucson Gem and Mineral Society, Inc. participate as judges at the SARSEF Fair and award four outstanding science projects in the area of Earth Sciences with one-year honorary family memberships in Tucson Gem and Mineral Society, Inc. plus a gift packet. Semifinalists from the SARSEF Fair later compete for the title of "America's Top Young Scientist of the Year." The Tucson Gem & Mineral Society supports the promotion of mineral knowledge in our local Tucson community through interactive hosted events. We open our doors to the larger community beyond the rock and gem lovers with the hopes of inspiring kids and families with the joy as the come to know more about rock and minerals. Keep an eye on out for our next Family day event!